The central vision of NIDO Europe is to bring Nigerians living in Europe together and to identify those willing to offer their skills (Education, Information Technology, Health, Economic, science, Administration, Law, Political and Corporate Governance, Management etc.) to assist Nigeria’s national development. These skills will be needed in developmental projects by government and non-governmental organisations. 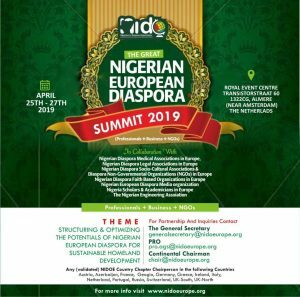 NIDO Europe as a result requires those Nigerians living in Europe who can afford to spend a period of time in Nigeria to contribute their skills to help Nigeria’s developmental process. NIDO Europe provides the unique opportunity for Nigerians living in Europe to learn to work and collaborate with one another in the task of nation building of our homeland. The organisation strongly believes that Nigerians in Europe can make significant contributions towards Nigeria through programs, policies, and advocacy to harness their talents, expertise, and resources for Nigeria’s development and nation building. The highest organ of NIDOE is the General Assembly made up of members across Europe. The Organization is governed by its Board of Trustees (BoT), who are fit, proper and accomplished individuals drawn from its membership and representing diverse professions. The 19 Regional Chapters are governed by Chapter Executives headed by a Chapter Chairperson. NIDOE has chapters in Austria, Belgium-Luxemburg, Denmark, Finland, France, Germany, Greece, Ireland, Italy, Netherland, Poland, Russia, Spain, Sweden, Switzerland, Turkey, United Kingdom (2 chapters) and Ukraine. The BoT and Chapter Representatives meet yearly at a Summit to review policy and chart new directions for the organization. The Annual General Meeting (AGM) holds on yearly basis. The organization has an Advisory Board with a mandate to provide advice and counseling to the organization through the Board of Trustees. Promote, support and encourage global trade awareness and moral consciousness that promote positive business climate between Nigeria and United Kingdom. Improve image of Nigeria to reinforce business and investment opportunities. Leverage Nigerian Diaspora economic, human, and technology resources for Nigeria’s development. To promote the spirit of patriotism amongst Nigerians living in Europe and encourage their participation in the affairs of Nigeria. To encourage Nigerians living in Europe to be good and law-abiding citizens of Europe. Promote knowledge transfer and information sharing among all Nigerians in Europe, and the public and private sectors in Nigeria. To establish and maintain close liaison with the Nigerian and European governments and other representative bodies having objectives similar in whole or in part to NIDO Europe south. To assist in promoting and enhancing a good image for Nigeria in the international arena in all areas, by whatever ethical and legitimate means that are feasible. To encourage contacts and networking amongst Nigerians living in Europe, the Americas and elsewhere as well as with community groups, voluntary organisations, government departments, statutory and non-statutory authorities, businesses, individuals and all other organisations, and in particular based on pressing social, economic, democratic and cultural issues in Nigeria. Provide linkages, policy input, and guidance to government. To serve as advisers and partners to the Nigerian government and other corporate bodies on specific matters of business, social, economic and cultural initiatives in the interest of Nigerians and Nigeria. To develop a record list of Nigerian professionals in Europe, whose background, experience and contact could help facilitate the development of Nigeria. To encourage and facilitate Nigerian professionals and any other humanitarian organisations in Europe to undertake free voluntary service in Nigeria. To assist the investment plans of Nigerians in Europe, who wish to invest in the Nigerian economy; and also facilitate Nigerian professionals in Europe, who wish to take up positions in Nigerian Public or Private sector. To serve as technical advisers, partners and act as catalysts with Nigeria with respect to development of policies, organisation and implementation of social and economic programmes. On specific requests from Government, NGOs and other bodies, incorporated or unincorporated, to provide services or give advice on specific matters of social, economic or cultural projects in the interest of Nigerians and Nigeria.